What are you charging for your intuitive readings or healing work? Is it too little? Is it too much? Will your rates scare people away? How come someone else with half your experience charges twice what you do? And gets it? Putting a dollar value on the work of your soul brings up all your fears about what others think, how much value do you bring to a session and a thousand other things. Whether you charge $6, $60 or $600 if you can’t hold the energy of that investment level, no one will pay you. ➥ Does your voice quiver when someone asks you what you charge? It can make you feel like you’re this greedy person who’s only in it for the money, doesn’t it? Let’s get real here: your skill set has been earned. Whether you’ve taken a thousand classes or just come by it naturally and built on it, it’s been earned. You should be compensated for your skills just as anyone else would be. A surgeon may love what she does like nothing else but she still understands it’s a business and is how she cares for herself and her family. Why not you? Isn’t it the same thing? Confidently stand in the value you offer! 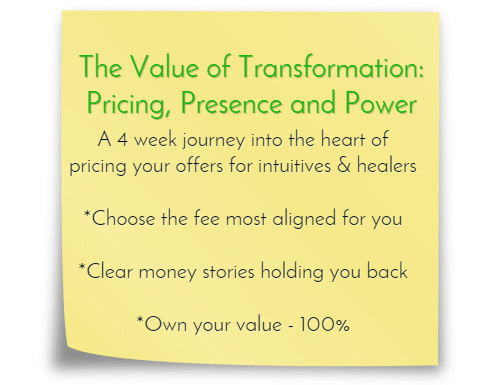 ✼ Is your pricing structure in alignment with where you are on your path? How do you even know? We’ll look at what others are charging, where you are on that scale and all the things that go into deciding what to charge. ✼ Don’t collapse into yourself when others question your rates! We’ll cover how to stand confidently in what you charge no matter what anyone says. ✼ Old money stories messing with you? Let’s bring them into the light and move them out! They’re standing in your way and the only way out is through! ✼ And more – you’ll leave feeling good about what you offer and have the confidence to say it to anyone who asks – without flinching and without hiding! ✼: Members only Facebook Group so you can get help and support from fellow intuitives and healers. If you’re ready to *finally* get past the “What the heck do I charge” problem, click the button below and join in! I promise lots of good content, discussion and support in these classes. Like you, I love being up in the high vibrations working with my clients. But that doesn’t mean we can ignore the ‘business’ side of our work. In this series of trainings, I help you learn and implement the strategies of a professional (and profitable) intuitive practice. 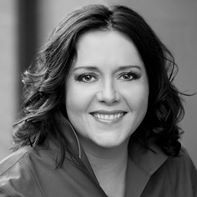 I’m a crystal clear Spirit Guide channel who has spent thirty years in the world of financial investment advisors and use that very grounded, logical side to make sure everything that comes through is down-to-earth and do-able. I know how to blend both the woo and the business and can help you create the intuitive practice that serves you while you serve others.